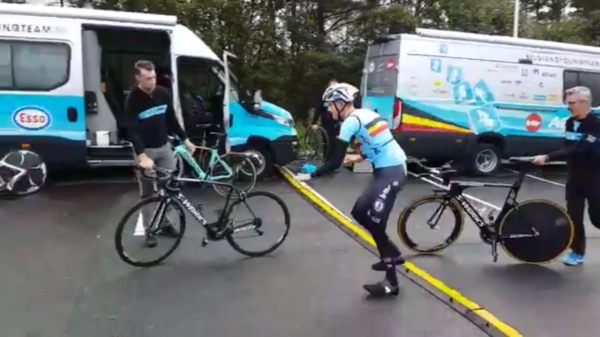 The Belgian team spotted practicing their bike changes ahead of the elite men’s TT at the World Road Championships. There will be a mat marking out an area where a bike change can take place before the final climb. The gold medal in the elite men’s TT at the World Championships will, barring incident, be won by the strongest rider on the day. But a bike change will also be important. And so the Belgian team has been practicing its changeovers in Bergen ahead of the test. In this video clip Laurens De Plus is practicing with staff so they all get it right on the day. Because the first part of the course is flat and the finish involves significant climbing, many riders are expected to change bikes in the race against the clock. A mat will be placed on the road just before the climb and will act as a mini pits area in which the change must take place. The mat will also make it easier for riders to grip the road in their cycling shoes, and thus speed up the change. Riders will be permitted to have staff waiting for them to aid their bike switch and to push them off. Many of the nations will be used to changes as they are common in cyclocross. But with road racing, switching bikes is not done in a pits area like is planned at these worlds. The switching normally takes place on the open road, with bikes taken from the team car for the rider. When the Worlds TT course was unveiled it was controversial with its uphill finish. The first portion of the course is mostly flat. That is then followed by a long section of climbing at the end. As a result, many felt it was perfect for a bike change. The TT is 31km and features the 3.4km climb of Mount Fløyen at the end. It rises over nine per cent and the final kilometre is over 10 per cent. It has been a controversial inclusion because only the elite men’s TT finishes there. The UCI is clearly looking to attract the major Grand Tour riders to the Worlds TT this year.